The preschool treat I did take. (See Definitely Cannot Force Three-Year Olds to Try) The theme for the week was Apples! The letter of the week: A. I went through a lot of back up ideas when I realized I couldn’t take the muffins I had intended to take:: dried apricots, asparagus, animal crackers, applesauce, American cheese cut out in the shape of an “a,” apoplectic muffins, armageddon cookies, accidental food, angry teddy grahams, and Apple Jacks. I didn’t go with any of those. You’re very welcome, bugslies. Stir flour, cinnamon, baking soda, and salt together in a medium bowl and set aside. Cream the butter and brown sugar with hand mixer until fluffy. Beat in egg and vanilla then the flour mixture. Preheat the oven to 325 degrees F. Drop rounded teaspoons of dough and bake for 12 to 15 minutes. Cool on cookie sheet for two minutes then transfer to wire racks to cool completely. Streusel. Mm. I guess it’s a thing with me. Maybe it’s partly because I know the practice of spelling streusel correctly. “U” after the “e”!! Maybe it’s also because I like new and more complex things, and I’m still getting the handle of it. In a large bowl, sift flour, baking powder, baking soda, salt, and cinnamon. In another bowl, whisk eggs, yogurt, and melted butter. Add the sugar and whisk to combine. Add to the dry ingredients and mix until just combined. Fold in the apples. 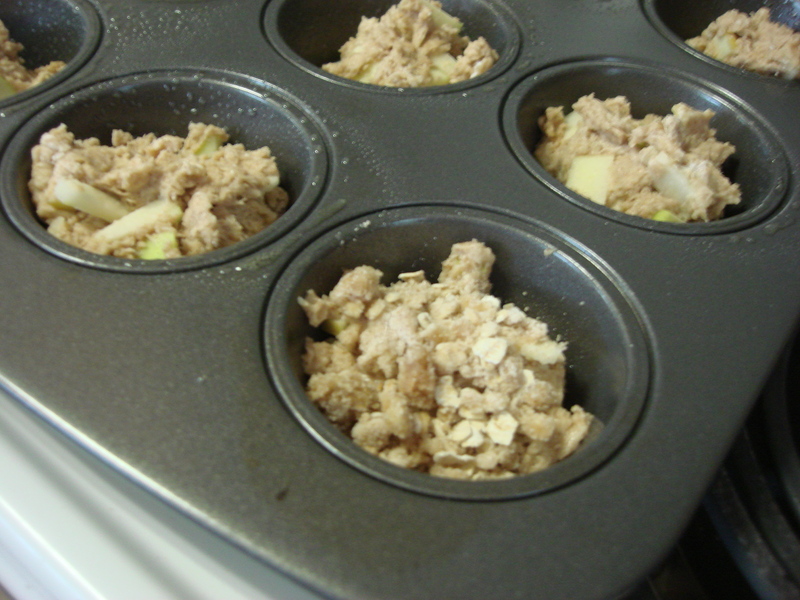 Spray a 12-cup muffin tin (I splurged! I have one now.) with cooking spray and divide the batter amongst the tins. Only fill about 2/3 full or less if you think you’re going to be serving them to three year olds and you also have an extra 6-cup muffin tin you’d like to use for the extra. Streusel topping: Combine all the ingredients and mix until combined and crumbly. 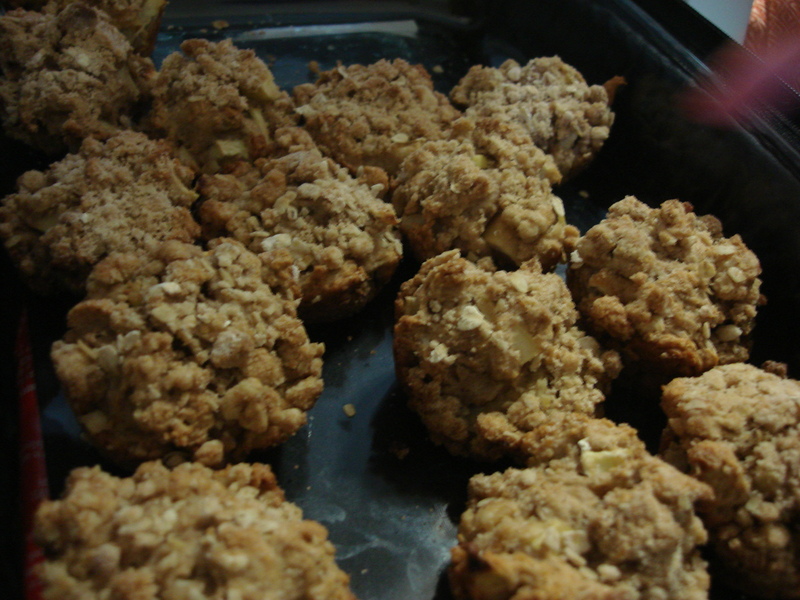 Sprinkle about 1 T of streusel over each muffin. Bake about 25 minutes or until tester comes out clean. Let them cool in the tin for 10 minutes. Continue cooling on wire rack before serving.